Get your hands to work with this Roasted Tomato Thin Crusted Pizza. We all know what it feels like to crave that slice of pizza on a fun Friday night. 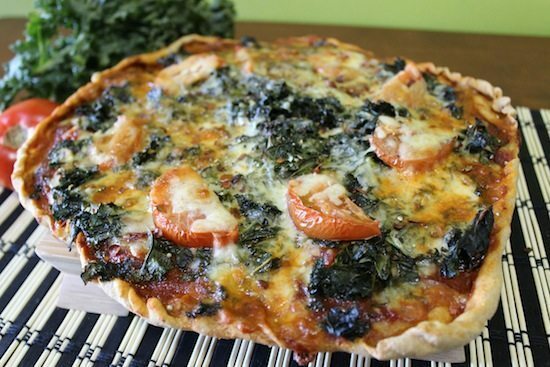 Top your pizza with kale and tomatoes, but feel free to top with whatever veggies you have on hand or whatever is best for the season. 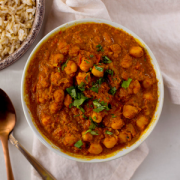 You can use spinach, onion, tomatoes, peppers, eggplant, mushrooms, or anything else you want! 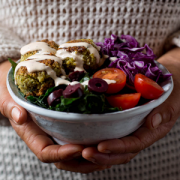 It is recommended that half of your plate should be filled with vegetables and recipes like this are an excellent way to get that fix. Plus, veggies offer natural vitamins, minerals, and fiber that we need to keep our cells functioning properly. Start by making that dough. Mix your flour and yeast together first. Add in your oil, water, and honey or maple syrup. Using your hands, work the dough into a smooth ball. The dough should be soft yet sturdy. The key is adding just the right amount of flour. If the dough is too loose or falls apart easily, then add more flour. If the dough is too stiff, add in some more water. Knead the dough for about five minutes. Wet a couple of paper towels with water. Place the dough in a ball and place in a bowl. Cover the entire bowl with the paper towels and cover the bowl with a plastic bag. Let the dough sit at a warm spot in the house for at least an hour and a half. Once, the dough has doubled in size, remove from the bowl and flatten out the dough on a lightly floured surface with your hands until it is about double in diameter. If you don’t have a rolling pin, keep stretching the dough out with your hands until it is all uniform. If you do have a rolling pin, roll out the dough for about ¼ inch crust thickness. Slightly crease up the edges of the pizza dough for a nice pizza crust. Place the dough on a round baking dish and add your tomato sauce evenly across the dough. 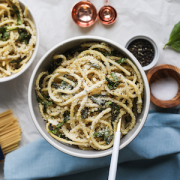 Add your kale, tomatoes, cheese, and any other veggies toppings you want. Bake at 500F for about 10-12 minutes or until the crust is nice and crispy. Why order your pizza when you can make your own healthy version with your most favorite toppings? What are your favorite pizza toppings? Let us know what you think in the comments below! Mix flour and yeast together. Add in oil, water, and honey/maple syrup. Using your hands, work the dough into a smooth ball. The dough should be soft yet sturdy. If the dough falls apart easily, add more flour. If it’s too stiff, add in some water. Knead for 5 minutes. Lightly wet 3 paper towels with water. Place the dough ball in a bowl, and place the moist paper towels on top of the bowl. 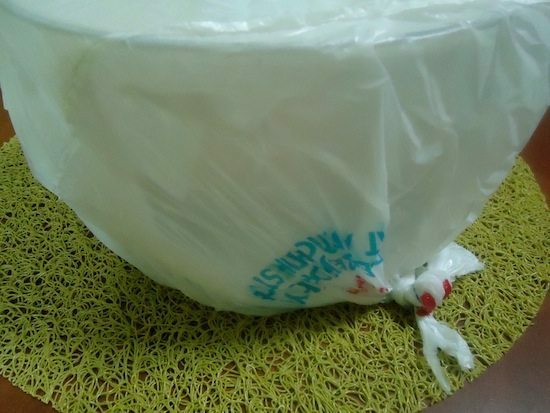 Then cover the entire bowl with a plastic bag. Let the dough sit at a warm spot in the house for a minimum of 1.5 hours. When the dough has doubled in size, remove from the bowl and on a lightly floured work surface, flatten out the dough ball with your hands until it’s about double in diameter. Now if you don’t have a rolling pin, you have to keep stretching out the dough with your hands until it’s uniform. If you do have a rolling pin, your life will be much easier. Roll out for about a 1/4 inch crust thickness. With your fingers, slightly crease up the edges of the pizza dough. 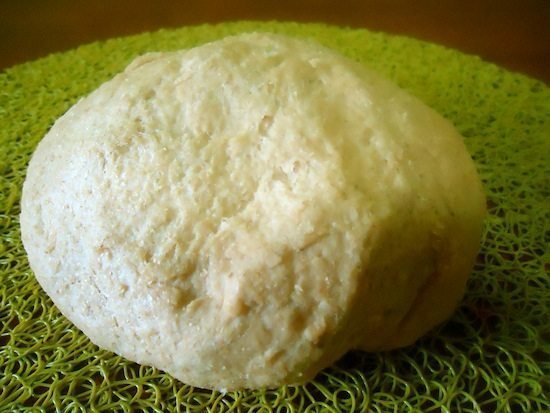 Place dough on a round baking dish. Add tomato sauce evenly to pizza dough. 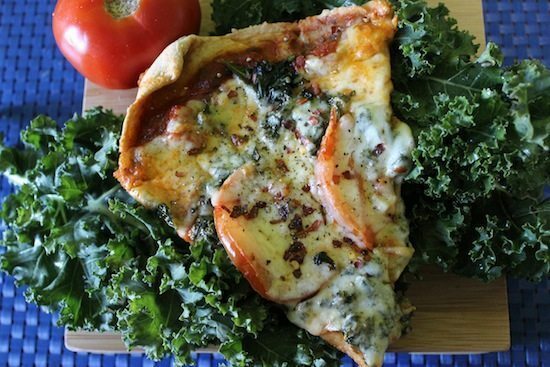 Then add kale, tomatoes, and lastly add cheese. Bake at 500F for 10-12 minutes or until crust is crispy. Enjoy! I made this a while back. The dough is so good! I love the whole pizza… it was just heavenly lol. Thank you Wendy and Jess for this amazing recipe. I am going to make this again tonight, actually. I also wanted to say that I love both of your personalities,hair, and style.